Automated quality check and correction of fluid compositions. Extension of Cubic Plus Association (CPA) model to be applicable with the Peng-Robinson EoS. Wax deposition simulator DepoWax extended to support the Matzain wax deposition model as an alternative to the RRR model. Revised interaction parameters for H2O-CaBr2 and CaBr2-MEG to improve hydrate predictions at high pressure. Tuning to PVT data using PC-SAFT EoS. PC-SAFT model available in the interface options to Eclipse Black Oil, VIP Black Oil, Nexus Black Oil. and IMEX. The number of phases handled by Multi Flash option increased from 4 to 5. A CVD experiment for oil mixtures can be simulated and experimental data used in regression. Option to plot type and number of phases (max. 5) in a user defined P & T range. Data for asphaltene onset pressures and for Asp in STO can be stored in PVTsim Nova database. Asphaltene simulation results can be compared with experimental data using a new Compare with Asphaltene Data option. Hydrate PH flash option introduced, which enables simulation of the heat to be added to melt hydrates. Scale formation can be simulated for an entire PT- grid. 2D and 3D plot options showing how scale precipitation develops with P and T.
Water Analysis Conversion option updated to automatically store converted fluid composition in PVTsim Nova database. New option for import of Prosper EoS files. Multi Phase Meter interface option updated to support Roxar units. Mix option updated to give correct CSP viscosities for mixtures of viscosity tuned fluids. Lumping kept when two common EoS fluids are recombined. Inconsistency between CPA and SRK parameters corrected. Characterized regression updated to support tuning on Vc not only for viscosity experiments, but also for viscosity data points. Clean for mud “STO Oil + Gas” option updated to also work for extended GC fluids. Acceptance criterion for STO oil density changed ±0.02 g/cm3. MEG-TEG interaction parameters updated to avoid phase split in systems with both components present. Bo and Bg included in output and plot. Viscosity experiments for gas condensates can be simulated and used in regression. Viscosity experiment can be simulated as a CVD experiment as an alternative to a differential liberation experiment. Updated to delete temporary output files. Phase Viscosities option corrected to give the correct relative mobility of gas and oil. Phase Viscosities option made the default choice. Default number of cells and time steps modified to give a better match of the recovery at pressures below MMP. Bug corrected to give the right CSP viscosities in depth gradient option. Bleed made default for the pressure stage to atmospheric pressure. C7+ isomers allowed in contaminated fluid compositions when estimating weight% contaminate of STO oil. Updated to work when H2S amount input as weight% or mg/l of Total Mixture. Column header for H2S partition coefficient corrected from Aq/Liq to Liq/Aq. Minimum temperature for Full Asphaltene Phase Envelope can be defined by user. Updated to give same tuning results before and after Asp/non-Asp split. Asphaltene weight% is included in output from Asphaltene Tar Mats option. Simulation time corrected for output in the unit of Day(s). Output concentrations of CO2 and H2S corrected. Molecular weight of acetic acid corrected. Corrections made of gas solubilites at high pressure and pH far away from scale precipitation. Unit for ion concentrations changed from mg/l H2O to mg/l salt water. Bug corrected to solve Eclipse Comp Import issue. COMPVD compositions output with more digits to ensure mole fractions add up to 1.0. Save Fluid option modified to save characterized fluid instead of plus fluid. Rso output in MScf/bbl with PVCO format. Rv’s output for multi stage separators corrected for cases with temperature increase from one separator to the next one. Bug corrected in API versus depth option. Reference pressure and reference depth output in Rs/Rv and API vs. Depth tables. Updates to always have vapor enthalpies increase with temperature at a given pressure. Correct message given when all PVTsim licenses are occupied. License Manager (LMTOOLS) shifted to newer version. Option to open PVTsim Databases of versions 19-21 reintroduced. 2,2,4 trimethyl pentane added to pure component database. One of the most challenging EoS modeling tasks is to develop a common EoS model for multiple fluids with gas injection. With gas injection being used as an EOR technique for shale fluids, reservoir engineers working with PVT modeling of shale fluids are frequently facing such task. The time spent on developing a common EoS model for reservoir fluids with gas injection can be reduced considerably by following the simple recipe given below. It is a requirement that swelling data exists and the swelling experiments have been continued until the saturation point changes from a bubble point to a dew point as sketched in Figure 1. Figure 1 Swelling experiment with shift from bubble point to dew point. The data is to be modeled using a volume corrected cubic equation of state as for example SRK-Peneloux or PR-Peneloux. It is a further requirement to have access to a multi-fluid common EoS characterization procedure as described by Pedersen et al. (2014). Saturation point of reservoir fluid at reservoir temperature. Density of reservoir fluid from flash to standard conditions (STO oil density). Critical point of reservoir fluid. The saturation point of the reservoir fluid can generally be matched by adjusting the plus molecular weight by 5-10% while keeping the weight% composition constant. Such adjustment is justified because of the experimental uncertainty on the plus molecular weight. The STO oil density can be matched by adjustment of the Peneloux volume correction parameter of the C7+ components. The critical point of a reservoir fluid will not in general be known, but it can be determined in an indirect manner. Figure 2 shows two phase envelopes. They are for the same oil mixture, but using two different EoS models (EoS 1 and EoS 2). 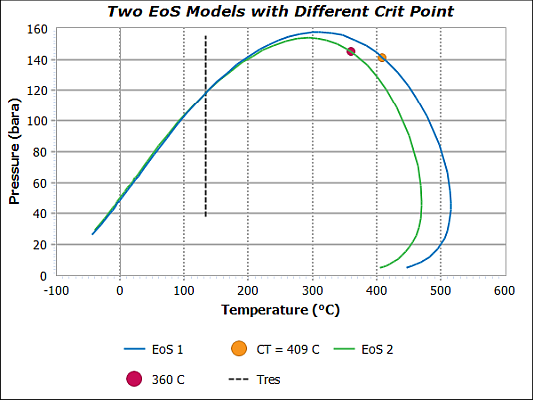 The saturation pressure at the reservoir temperature is almost the same, but with EoS 1 the critical temperature is 409 oC (768 oF), while it is only 360 oC (680 oF) with EoS 2. Figure 2 Phase envelope of oil mixture using two different EoS models. Figure 3 shows experimental and simulated liquid dropout curves for swollen mixtures of the oil in question using EoS 1 and EoS 2. With 150 mole% gas added (grey points), the saturation point is a bubble point. With 400 mole% gas added (dark blue points), it has shifted to a dew point. The fluid composition becomes critical somewhere in that interval. At near critical conditions the liquid dropout curve would start out almost vertical from either 100% liquid volume (T < Tcrit) or from 0% liquid volume (T > Tcrit). The experimental liquid dropout points for 150 mole% gas added in Figure 3 shows a fairly steep decrease in liquid volume with decreasing pressure signaling a fluid approaching criticality. The liquid dropout points for 400 mole% gas added on the other hand has a relatively moderate increase in liquid volume with decreasing pressure. The simulation results with EoS 2 reflects the experimental behavior, but EoS 1 does not. Figure 3 Exp. & Sim. liquid dropout for swollen mixtures. % gas is mole% gas added per initial mole oil. Figure 4 shows experimental and simulated swelling saturation pressures. With both EoS models the experimental saturation pressures are matched well, but 328 mole% of gas must be added per initial mole oil to create a critical composition with EoS 1, while only 244 mole% gas is required with EoS 2. This is reflected in the simulated liquid dropout curves in Figure 3. With EoS 1 the liquid dropout curve starts out relatively steep after 400 mole% gas has been added, which is an indication of near-critical behavior. With EoS 2 the simulated liquid dropout curve after addition of 400 mole% gas is relatively flat, signaling some distance from a critical composition. Figure 4 Experimental and simulated swelling saturation pressures. The observed difference in critical point on the swelling curve in Figure 4 leads back to the difference in critical point in Figure 1. The higher the difference between the critical temperature of a reservoir fluid and the reservoir temperature, the more gas is required to shift the critical temperature to that of the reservoir. As can be seen from the right hand plot in Figure 3, EoS 2 provides as almost perfect match of the liquid dropout curves of the swollen mixtures. The good match is achieved solely by tuning to a critical temperature of 360 oC and to the saturation pressure at the reservoir temperature. With EoS 1 too much gas is to be added before a critical composition is reached. This is due to the fact that EoS 1 predicts a too high a critical temperature of the reservoir fluid. An alternative to matching the critical point of the reservoir fluid itself is to match the critical composition on the swelling curve. For the case studied, the critical composition is in the interval from 150 to 400 mole% gas added per initial mole oil, and therefore relatively undefined. In such case it can be easier to determine the critical point in an indirect manner as outlined above. The above can be condensed to the following regression strategy for multiple fluids with swelling data to be represented using a common EoS model. Choose a volume corrected equation of state (SRK-Peneloux or PR-Peneloux). Decide on an appropriate lumping scheme. Use the characterization procedure of Pedersen et al. (1992). i. Adjust the plus molecular weight to match the saturation point at the reservoir temperature using a constant weight% composition. ii. Adjust the volume correction (Peneloux parameter) to match the density of the liquid from a flash of the reservoir fluid to standard conditions. iii. Simulate the critical point of the reservoir fluid. iv. Simulate the swelling experiment. v. Check whether the critical temperature of the reservoir fluid is too high or too low. It is too high if the liquid dropout curve of the fluid from the last swelling stage increases too steeply with decreasing pressure. It is too low if the liquid dropout curve increases too little with decreasing pressure. vi. Carry out a plus regression (Christensen, 1999). The data tuned to is the saturation pressure at reservoir temperature and an assumed critical temperature selected in accordance with v. Do not tune to any other data. vii. Simulate the swelling experiment again. If the match of the liquid dropout curves of the swollen mixtures is satisfactory go to 5. Otherwise go to v.
Carry out a Common EoS plus regression. For each reservoir fluid tune to saturation pressure at the reservoir temperature and the critical temperature determined in 4. Compare simulated and experimental data. The above procedure can be expected to give a good match, not only of the data tuned to, but of all routine and EOR PVT data existing for the fluids to be represented by a common EoS model. For a reservoir fluid the saturation pressure at the reservoir temperature and the critical point together constitute a finger print. That is the reason a tedious parameter tuning can be avoided by directing the tuning towards the critical point of the reservoir fluid. 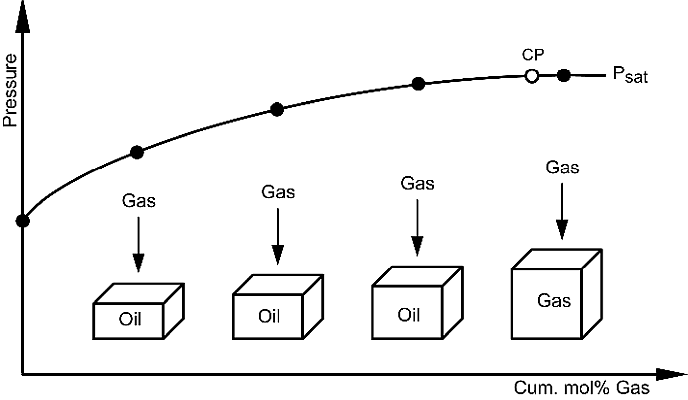 Christensen, P.L., “Regression to Experimental PVT data”,Journal of Canadian Petroleum Technology, 38, 1999, pp. 1-9. Pedersen, K.S., Blilie, A.L., Meisingset, K.K., ”PVT-Calculations on Petroleum Reservoir Fluids Using Measured and Estimated Compositional Data for the Plus-Fraction”, Ind. Eng. Chem. Res. 31, 1992, pp. 1378-1384.